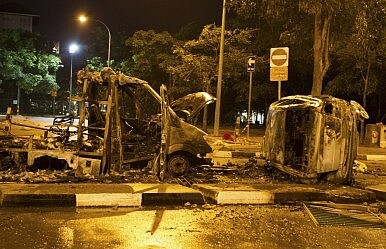 Singapore’s normally ordered society has been shaken by the rioting last weekend. Sakthivel Kumaravelu was killed last Sunday after being run over by a bus ferrying migrant workers from Little India – a messy, diverse and vibrant part of Singapore with a large number of South Asian shops and restaurants – back to their dormitories. The details of the accident are still murky, but the death of the 33-year-old man triggered the first riot seen in Singapore in more than four decades. Police cars and ambulances were attacked, some even torched. Eighteen people, including police officers and other emergency service personnel, were injured. Although quelled in an hour, the episode has shocked Singapore and produced another blemish on this prosperous island nation’s shiny track record. The government has been eager to spin this as a one-off drunken mob. Two Cabinet ministers were quoted saying that alcohol could have been a “contributory factor,” and a temporary alcohol ban is being imposed. Police have been given the powers to take action against anyone seen consuming alcohol in the area. The local mainstream media has also focused on the angle of alcohol abuse among South Asian migrant workers. Yet this narrative does not obscure the fact that in recent years many events that might not be considered “the Singapore way” have begun to occur. In November 2012, more than a hundred bus drivers for public transport company SMRT went on strike – the first in 26 years. In February 2013, a protest against the Population White Paper drew over 3,000 people, and organizers dubbed it the largest political protest in Singapore’s independent history. A follow-up protest in May again drew a significant crowd. The riot in Little India is simply the latest in a series of surprises. These occurrences all had different triggers and involved different groups within the population. They might not be directly connected to one another, but they all draw attention to the possibility that there’s more behind the city-state’s carefully manicured image of wealth and order. While other countries in the world have been rocked with economic uncertainty, Singapore has been doing well. The 2012 World Wealth Report put the country at the top of the list in terms of Gross Domestic Product (GDP) per capita. In many ways, this prosperity has not trickled down to the island’s residents: Singapore has one of the highest inequality levels in the developed world. The country’s eager dependence on importing cheap foreign labor has kept wages low especially for blue-collar workers, and there is no minimum wage. Although there is no official poverty line, the country also has a significant number of people considered as the “working poor,” struggling to make ends meet despite holding down jobs. Segments of society – both citizen and non-citizen – are beginning to feel disenfranchised, underserved and neglected, while the ultra-rich party on. Migrant workers, who provide the manual labor which props up this shaky system, face huge struggles. Housed apart from the main population, these imported workers are expected to clean the streets and work on Singapore’s many construction sites, while remaining largely separate from mainstream society. Even those who do interact with the workers – ferrying them to and from work or patrolling the areas where they congregate – face plenty of frustration. In the course of his research Bal has observed that the bus drivers and auxiliary police officers themselves receive low pay and work long hours. It is little surprise that there is often friction between them and the migrant workers. A Committee of Inquiry will be soon put together to investigate all aspects of the case. However, there has so far been little indication that the government will see this riot as a sign to rethink policies. Law and Foreign Affairs Minister K Shanmugam has said there is no evidence the workers were unhappy with either their employers or the government. But not everyone is convinced. Blogs and social media networks have been buzzing with commentaries demanding more introspection and reflection. Even if the everyday alienation of migrant workers was not a direct cause of the riot, the possibility of it being an underlying cause has not gone unnoticed. The streets have been cleared and it looks like business as usual in Little India. But the effects of Sunday night’s uproar linger on. Regardless of the official narrative we have once again caught a glimpse of the complexities lying beneath Singapore’s achievements. The problem of marginalized communities run far deeper than alcohol, and cannot be ignored for very much longer. All signs are pointing to a tough election for Singapore’s ruling People’s Action Party.